A body of stacked antique mercury glass orbs give this contemporary table lamp a stunning silhouette. This lustrous table lamp features an antique mercury finished glass base. The triple gourd design tapers for a pleasing fluid effect. A white linen shade offers a simple and stylish complement to the distinct body. Overall: 26 1/2" high. Shade is 12" across the top x 15" across the bottom x 10" on the slant. Weighs 3.74 lbs. A luxe table lamp design from the 360 Lighting collection of table lamps. Lucite base, off-white linen shade. Is the glass more of a gold mercury or silver? BEST ANSWER: Tricky question, from across the room, it appears more silver but the closer you get and depending on the angle and lighting in the room, it looks gold/mercury. I love them. Using them on my nightstands in my master. BEST ANSWER: Hi - The base without the shade measures 18 1/8" H x 5 1/4"W (widest point). The base foot print measures 5 7/8" wide. It's sometimes hard to judge how an item will look when looking at online pictures. This lamp actually looked better to me in 'real life'. I love mercury glass and the glass on the lamp is beautiful with just enough opaqueness. The lamp shade is quite nice and I like the lucite touches. My one anad only complaint is minor and that is that this is not a 3 way switch light, but I knew that in advance. It is energy light ready and so I am using a fluorescent light and it comes on right away and doesn't take time to get bright the way some lamps do. Overall I am very pleased with my purchase. I am using two lamps for my espresso stained nightstands. Todays popular material of Lucite and antique mercury glass married together are a decorators final touch. Truly a modern update to a classic lamp with metal or marble bases. The lamps are just beautiful illuminated as well as turned off due to the white linen lampshade. A must have for any one considering a modern approach using antique mercury glass room accents as well as lighting. The lucite finial is the perfect topper. Thank you for employing a very knowledgable staff at your customer service department and everyone there is very pleasant to speak with at Lamps Plus. I use this lamp for my bedside. It gives off great light to read by and the use of a dimmer switch creates ambience for every mood. 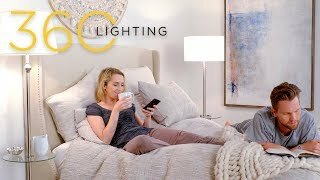 This lamp is beautiful, looks a lot more expensive than it was and adds just the right amount of bling without creating a cleaning nightmare. This is a purchase I won't regret. Bought two as bedside lamps. Love them! They look much more expensive than they are. Great size. Love the lucite trim mixed with the mirrored body of the lamp. Great look. I needed lamps in this size; most of the living room lamps I like were too big. I'm more pleased than I expected to be; the lamps are expensive looking, fashion-forward, yet blend well into the background. 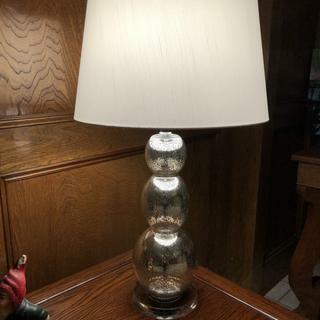 The mercury glass is very pretty and the lamps look great when lit. The simple shade is just right. I had never ordered a lamp by mail and was so pleased with this purchase. My bedroom lighting was too dark for reading but this solved the problem completely. Bright but not in a bad way. The lamp is so much prettier in person. Looks much more expensive than it was. Perfect for my night stands. Couldn't be happier! Disappointed as one of the lampas arrived with 2 missing parts. It took a week for the 2 parts to arrive after I called customer service. We had a very dark bedroom and these lamps really brightened the room up! Excellent, prompt delivery! The packaging is excellent and I would be very surprised if anyone ended up with a broken purchase. Awesome bright lamp, love the silver look with white shade! Very practical and stylish. It's light (a bit lighter than I anticipated) but it a nice size and makes a bold statement in our living room. Good one, however, may be too overwhelming for a small room. I much appreciate and thank Lamps Plus customer service for the free return service provided with this lamp and genuinely impressed with the prompt and hassle-free return and refund process. Thank You ! I would like to add here that I had received the product in what I can call as a Perfect Packaging ! I was impressed with the way the packaging was so detailed. Thanks for that as well ! Using in living room. Bought two and they look great. Packaged very well. Everything in good working order. Shipping was fast.